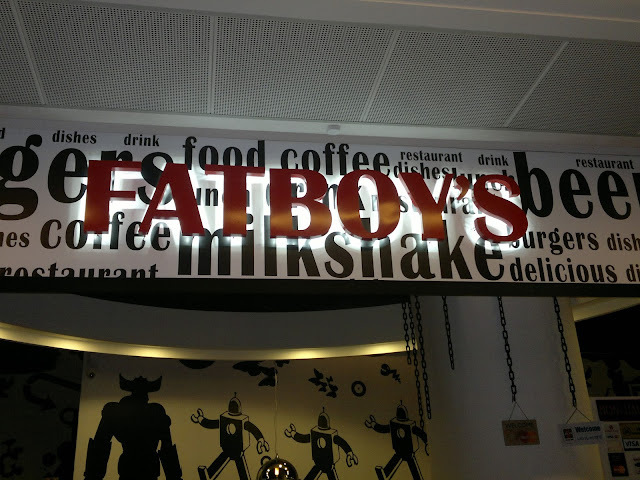 I have heard many new places offering them now and my goal by the end of this year to find the top 5 best Meatless Burger in town( those with ideas, pls let me know).So with this in mind,we tried Fatboys Burger Bar at Avenue K over the weekend. 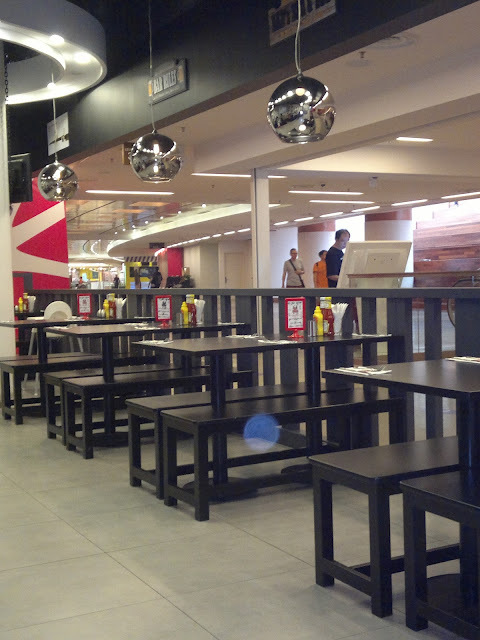 The place was nice with modern concept deco. Probably because its right at the top floor ( 1 floor below the Dinoworld), i felt the crowd was lesser and that is good for those folks who don;t fancy crowded areas. 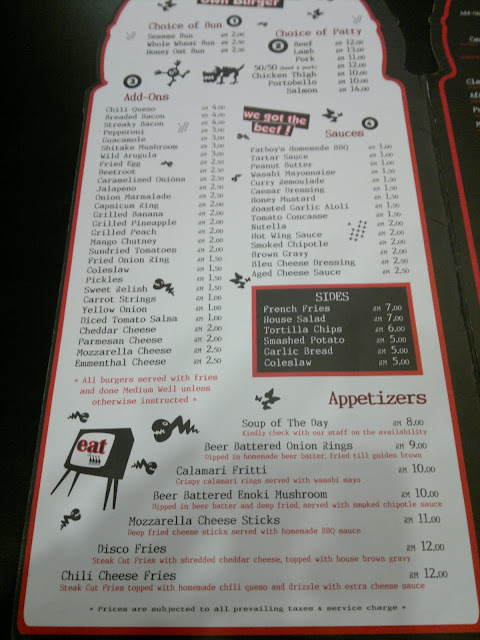 Excited and disappointed i was to see the menu. 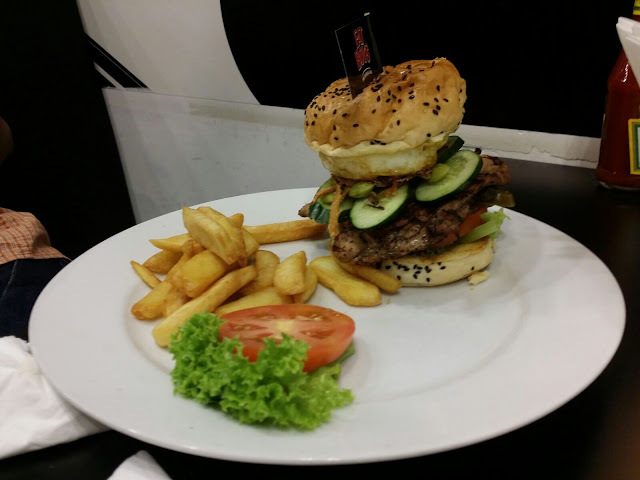 Disappointed because there was only one Vegetarian marked burger on its menu, but excited when I saw, that we can always opt for making your own burgers with lots of toppings and sauces of your choice.I decided to settle for the default burger to be safe. The Big Bello Burger ( RM18) is a huge burger with fries on the side. It has 6 layers of ingredients cushioned comfortably in between toasted whole meal bread. The first bite hit my tastebuds instantly with a , " OMG , its sweet? " Caught me off guard there. I had never expected a sweet burger . The top two layers were soft grilled green and red pepper, followed by a slice of melted mozarella cheese. After a few minutes , the brain starts to comprehend whats causing the sweetness : : The super juicy feeling combining tastes from the caramelized onions hanging gently over the sides, a thick fat slice of pineapple and two slices of awesomely marinated portobello mushrooms that were grilled to perfection. All of these rested on a smoked chipotle sauce on the base bun. The fries was nothing extraordinary. 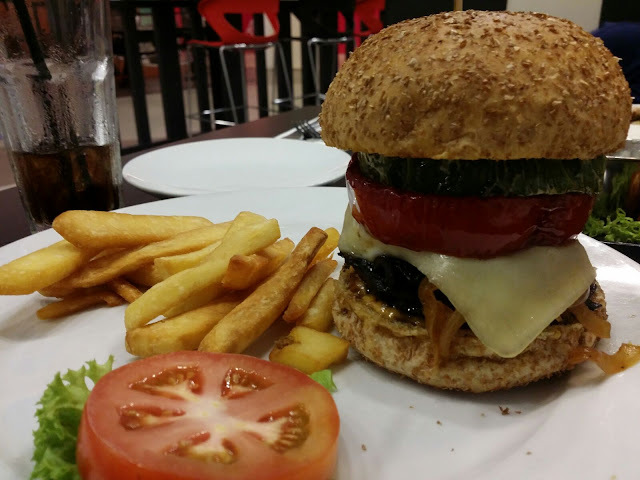 I found it really nice that there wasn't too much on the plate, so I could actually focus on the burger. The kids had chicken mac and cheese that could feed both my 9 year old and 2 year old. 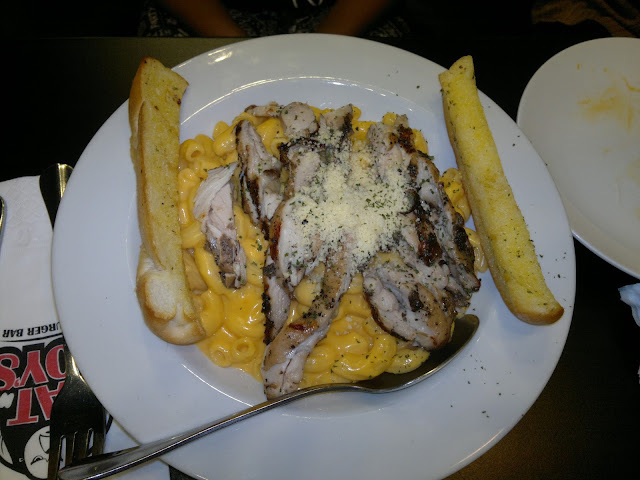 It was topped the with lots of grilled chicken, the mac were smothered with creamy cheese sauce. This dish comes with bacon bits, but we omitted it when ordering. It was topped up lots of Parmesan and guarded by two yummy garlic breads on either side. I tasted the mac , without the chicken and it was "Super CREAMY!" , no wonder both my little ones wiped it clean. Ragu opted for few non Vege items. 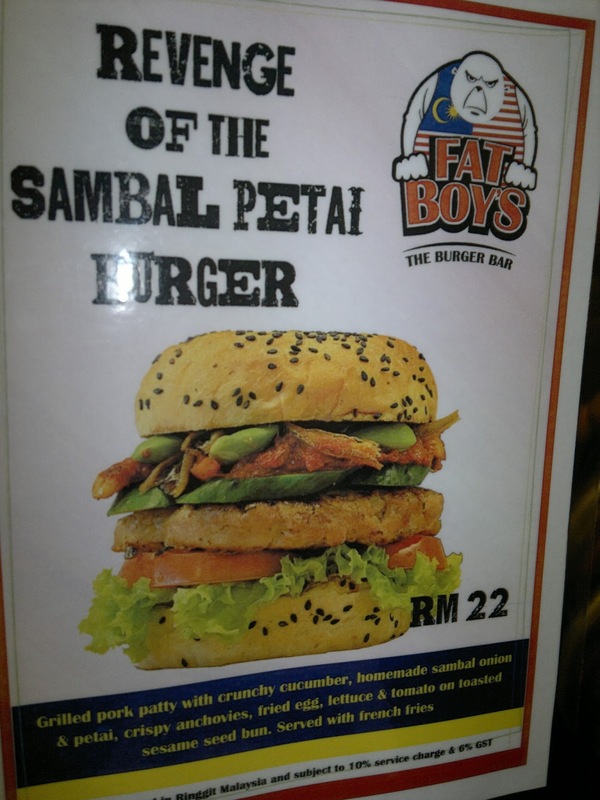 First thing that hit us on the table when we walked in was the " Sambal Petai Burger " WHAT???? 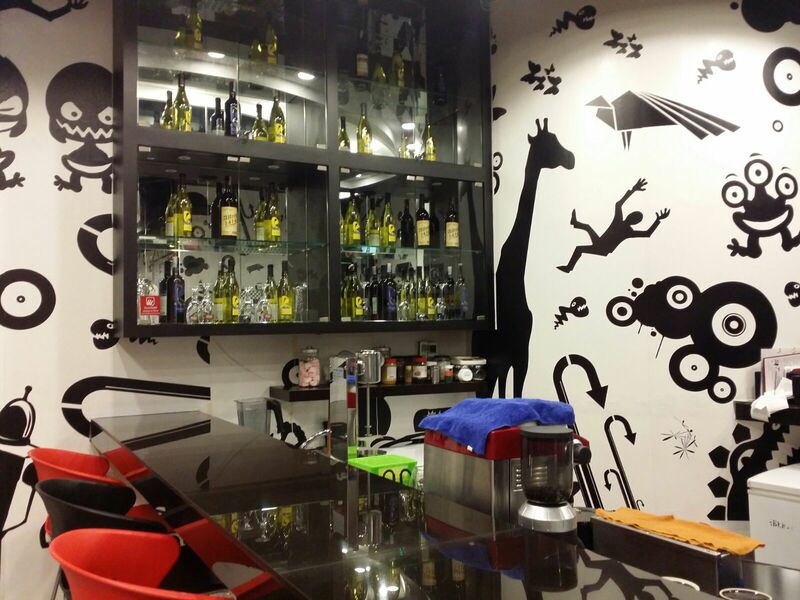 A true malaysian taste . The waited advised us that their sambal was not available and would replace it with some other spicy sauce that goes with the petai.We also asked for a chicken patty instead of pork.This is what Ragu got..
A tower of fried egg resting on a bed of petai and fried anchovies.then followed by cucumbers and grilled chicken patty in between a black sesame bun. The dish was too complex for Ragu,he didnt know where to begin.But one thing he did mention ,the sambal was the missing link to marry all the ingredients together. Hopefully it will be there next time. 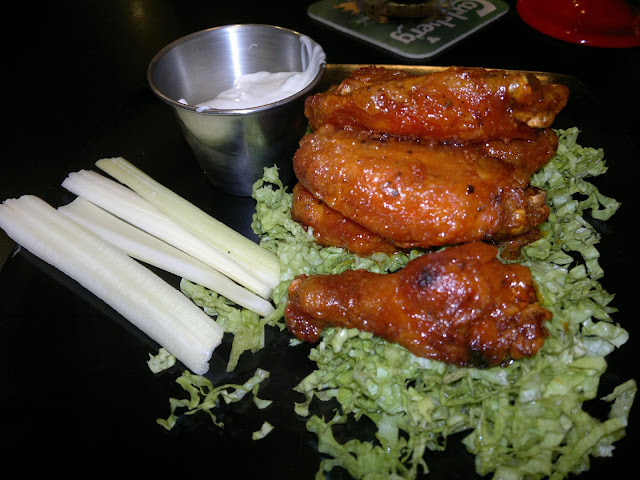 He also had the spicy chicken wings, that was served with a rich lovely creamy blue cheese dip. This place servers alcohol, so you can enjoy a nice chilled beer or wine with your mouthwatering burgers. 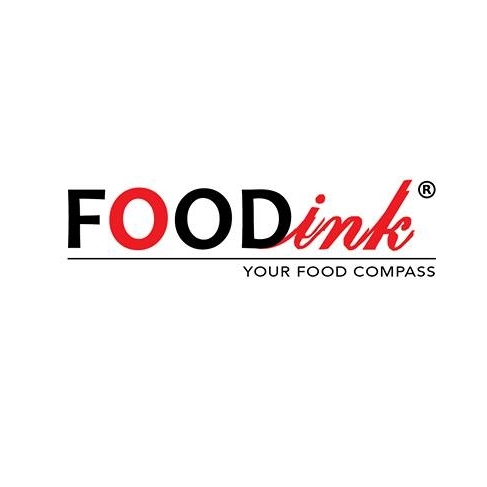 Although their webpage mentions 5 outlets, Publika, One City Mall, Avenue K, JB and Bangsar, their FB page also mentions one more additional outlet, in Melaka. 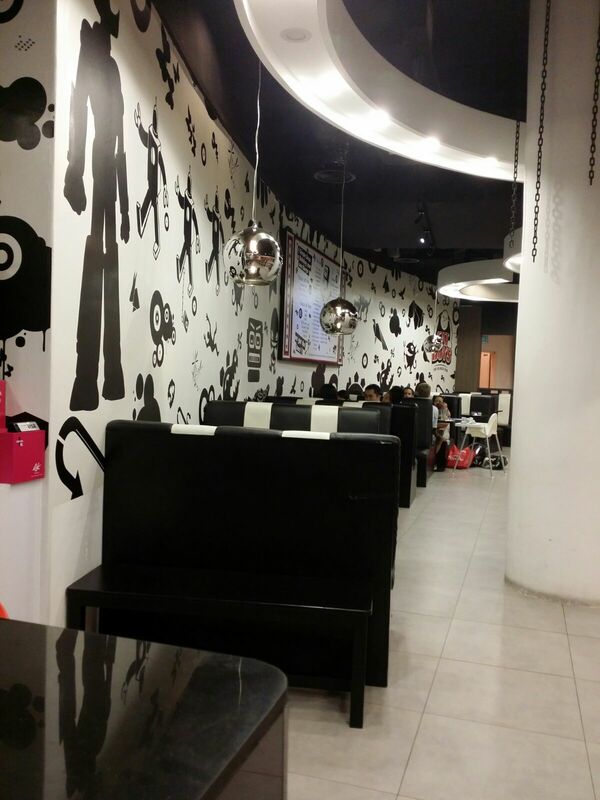 Hi, my name is Puja and I love finding good vegetarian food in and around Malaysia. Being brought up in the north of Malaysia where food is aplenty and top class, i needed to spot good ones in other parts of Malaysia too.